From winning the local Urban Taskforce Design Excellence Award for a medium-density building, the 17-storey block has now been selected as a finalist in the International Design & Architectural Awards with the winner to be announced in London next month. The Ceerose developed tower has also been shortlisted for the Idea Awards in Melbourne. Eliza comprises 19 apartments across the 17 levels, with a gross realisation of $70 million. There are 10, two-bedroom apartments on the lower floors that were sold off the plan and eight apartments on levels seven to 14. The apartments on levels seven to 14 are whole floor, four bedroom apartments. The crowning glory of Eliza, its penthouse, is three levels and is expected to go on the market next month, fetching $15 million. The penthouse includes a rooftop infinity-edge pool, limestone paving, hardwood timber decking, landscaped garden and outdoor kitchen. Designed by innovative architect Tony Owen using three-dimensional computer modelling and ‘visualisation’ software, which allows several users to work concurrently, merging and synchronizing individual ideas into one cohesive outcome. “Eliza is an example of ‘liquid architecture’,” said Mr Owen, who honed the technique on his own family home, Moebius House at Dover Heights, which also won international recognition. The facade of Eliza is contoured, sculptured and asymmetrical, with serpentine swirls and artistic flourishes. The form and fluidity of the building has been linked directly to important environmental factors, and at its rear is a living ‘green screen’– a five storey-high wall of evergreen climbing plants. 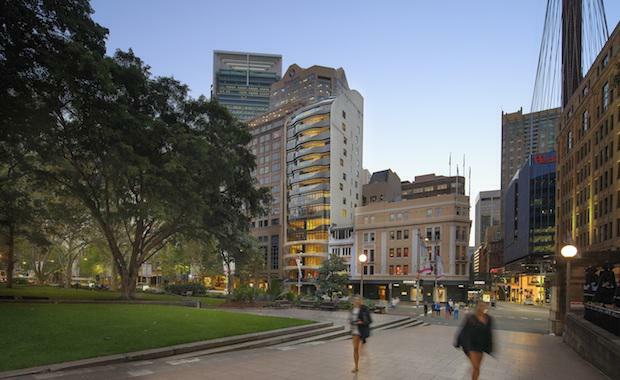 Managing Director, Edward Doucihi, said they wanted a building with an architectural point of difference that did justice to a landmark site in Sydney.